Indulge someone special in rich, delicious sipping with 12 gourmet coffees in this coffee gift set. Our 12 coffees of Christmas are ground to perfection and ready to brew. The ideal gift for coffee lovers, our elegant gourmet coffee gift box opens like a book, revealing the award winning coffee contents. 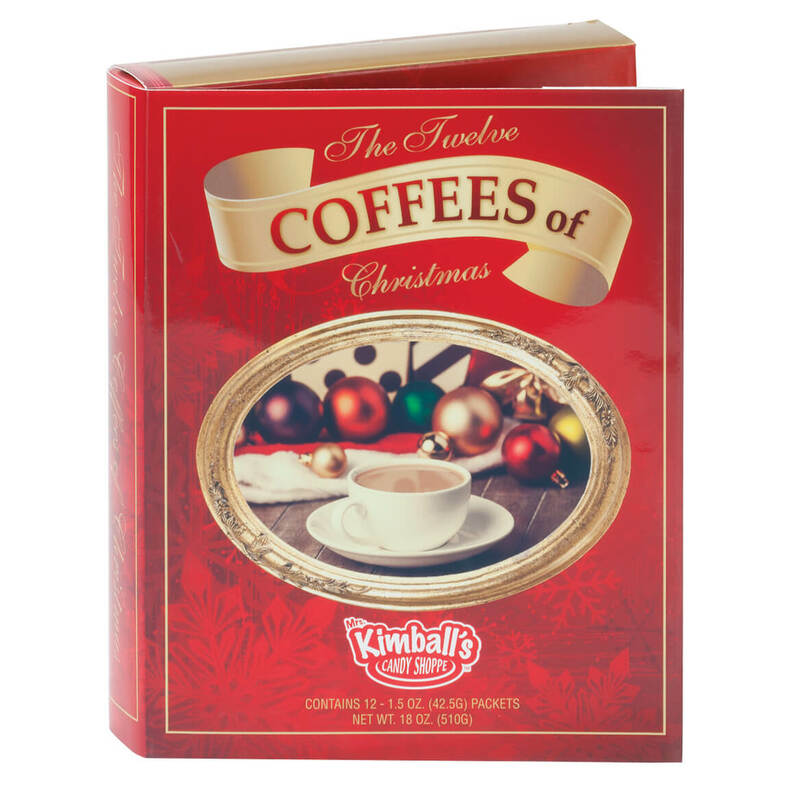 Each packet in this gourmet coffee gift set brews an entire 10- to 12-cup pot in any type of coffee maker. A deliciously aromatic tea gift set for all lovers of fine teas. Ashby’s® Teas of London has assembled this holiday tea sampler; teas of Christmas with 9 flavors of fine black, green, and herbal teas. You get four bags of each flavor, 36 tea bags in all. 10″ long x 11″ wide x 1 1/2″ high. 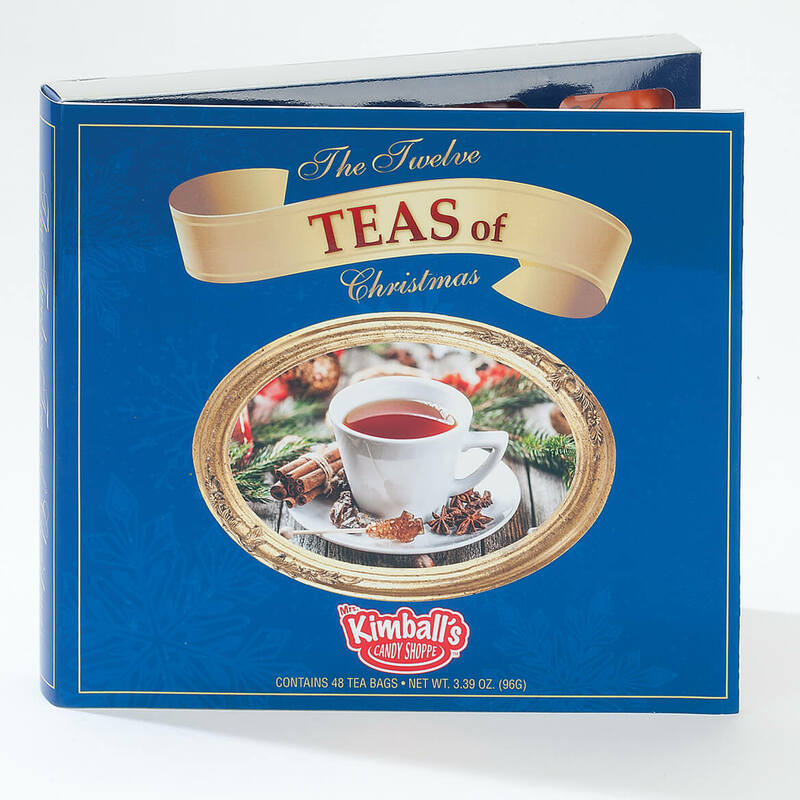 The 12 Teas of Christmas includes 12 flavors of fine black, green, and herbal teas. You get four bags of each flavor, 48 bags in all. 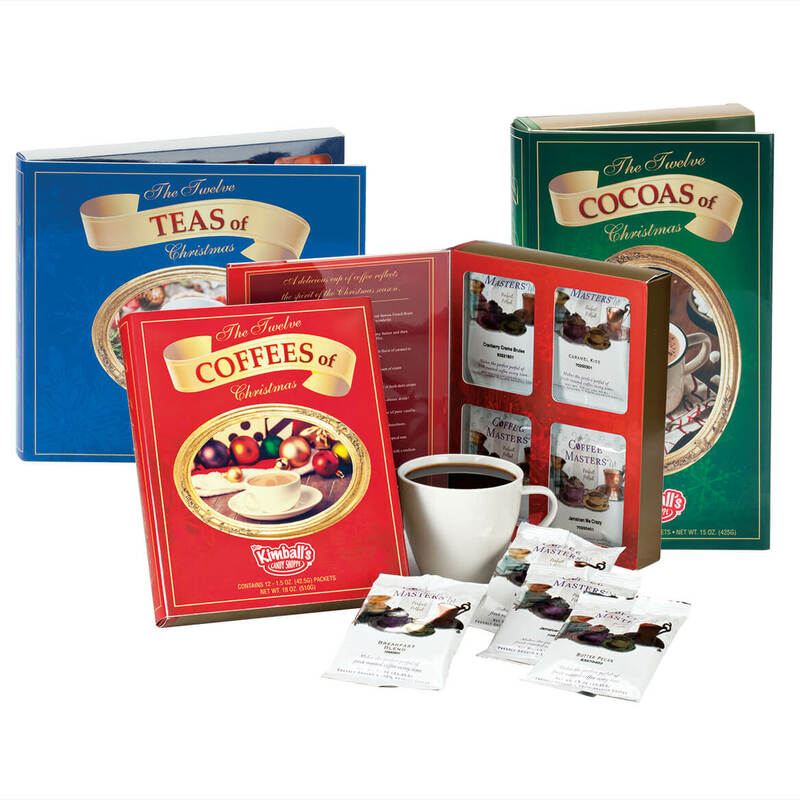 The 12 Cocoas of Christmas includes 12 packages of gourmet cocoa in a foil-embossed gift box; each makes 1 cup. The 12 Coffees of Christmas delivers delicious sipping with gourmet coffees, ground to perfection and ready to brew. Each packet brews an entire 10- to 12- cup pot, in any type of coffee maker. Perk up your coffee lover’s Christmas with a gift of gourmet holiday coffee! 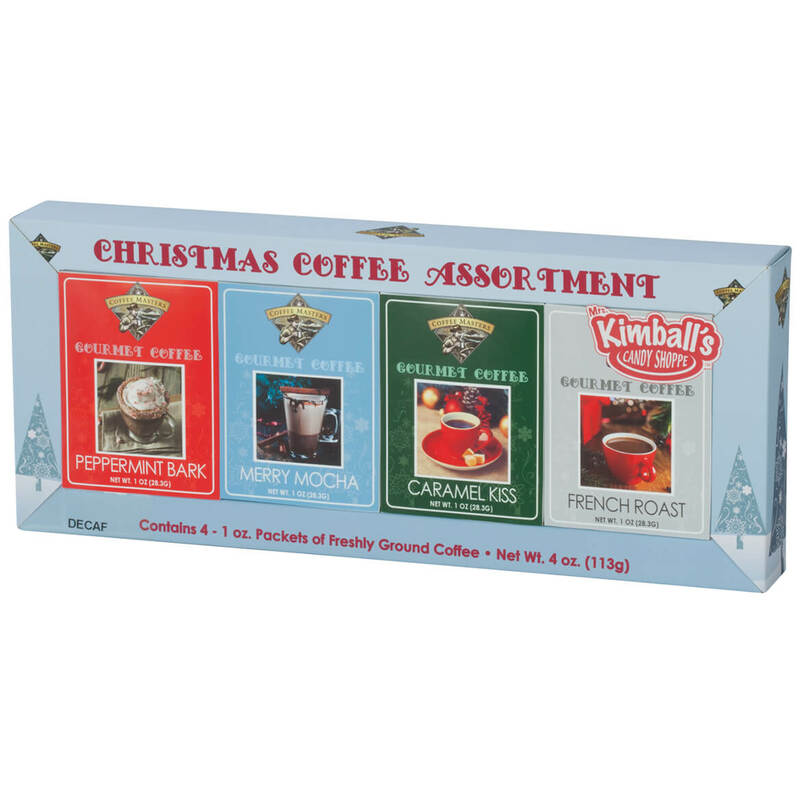 This Christmas coffee assortment boasts 100% Arabica coffee that’s roasted, flavored and ground in the USA—all 4 flavors packaged together in festive boxes (and so cute, you won’t have to wrap). Set of 4 includes: Caramel Kiss (with the rich, buttery flavor of caramel), French Roast (a medium-to-heavy bodied coffee bursting with rich aroma), Merry Mocha (a rich, creamy milk chocolate) and Peppermint Bark (with the fresh, cool taste and aroma of peppermint). Each 1-oz. packet brews the perfect 8-cup pot of coffee in a conventional coffeemaker or french press (2 teaspoons per 6 oz. of water). 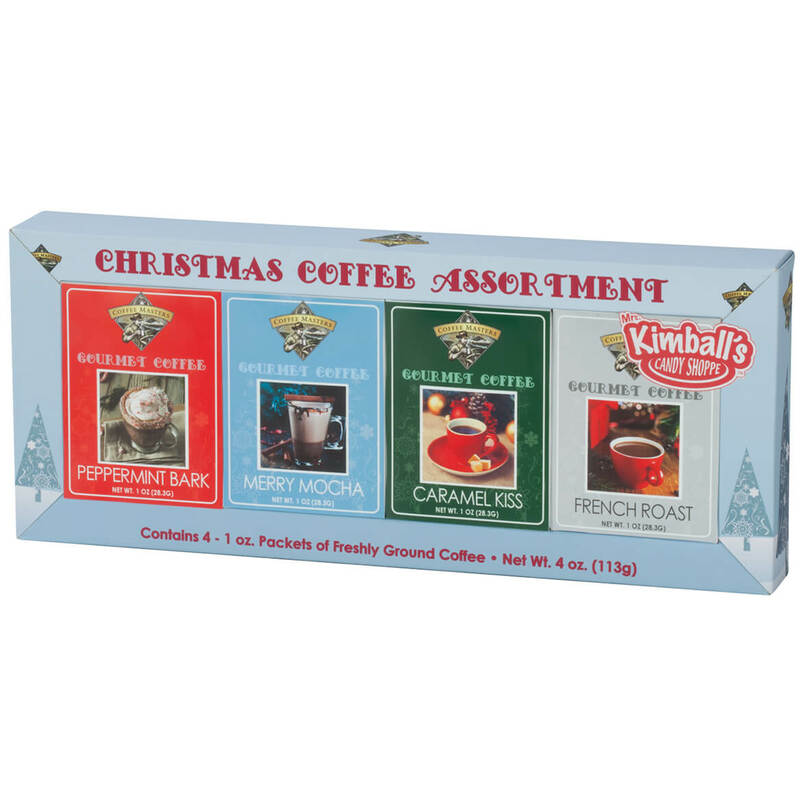 Offering all the rich holiday flavor without the caffeine, this Christmas decaf coffee assortment is a joy to any coffee lover’s world! The 100% Arabica coffee is expertly roasted, flavored and ground in the USA, assuring smooth satisfaction in each delightful brew. 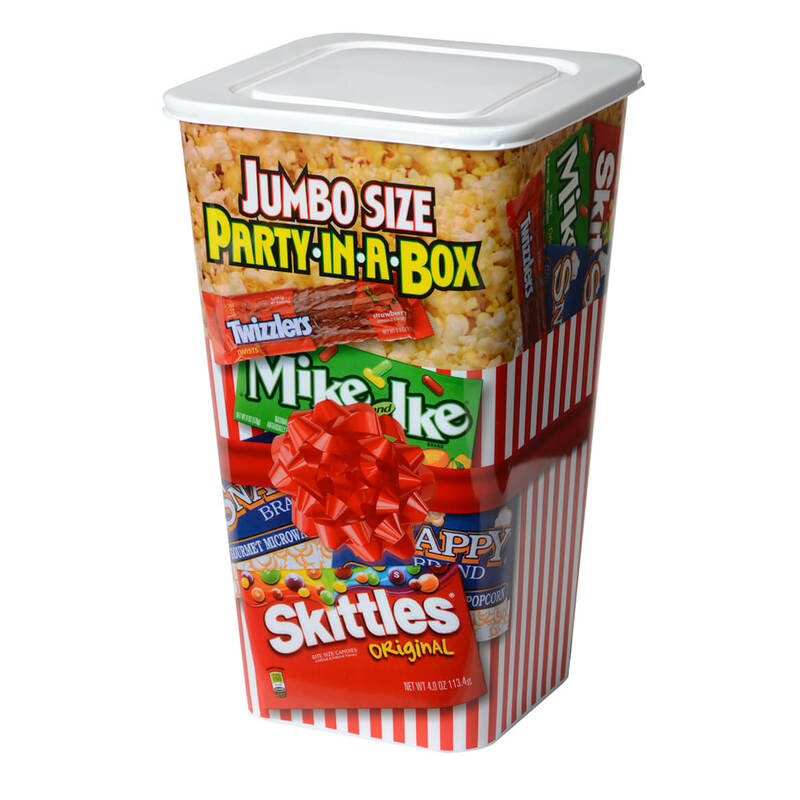 All 4 holiday flavors are nestled together in festive boxes for easy giving (no wrapping required!). Set of 4 includes: Caramel Kiss (with the rich, buttery flavor of caramel), French Roast (a medium-to-heavy bodied coffee bursting with rich aroma), Merry Mocha (a rich, creamy milk chocolate) and Peppermint Bark (with the fresh, cool taste and aroma of peppermint). Each 1-oz. packet brews the perfect 8-cup pot of holiday coffee in a conventional coffeemaker or french press (2 teaspoons per 6 oz. of water). A luxury for any tea lover on your gift list, this Christmas tea assortment offers your warm wishes, while expressing your good taste. Delicious any time of day, each flavor is produced in the USA and beautifully packaged with festive graphics … pretty enough to give without wrapping. 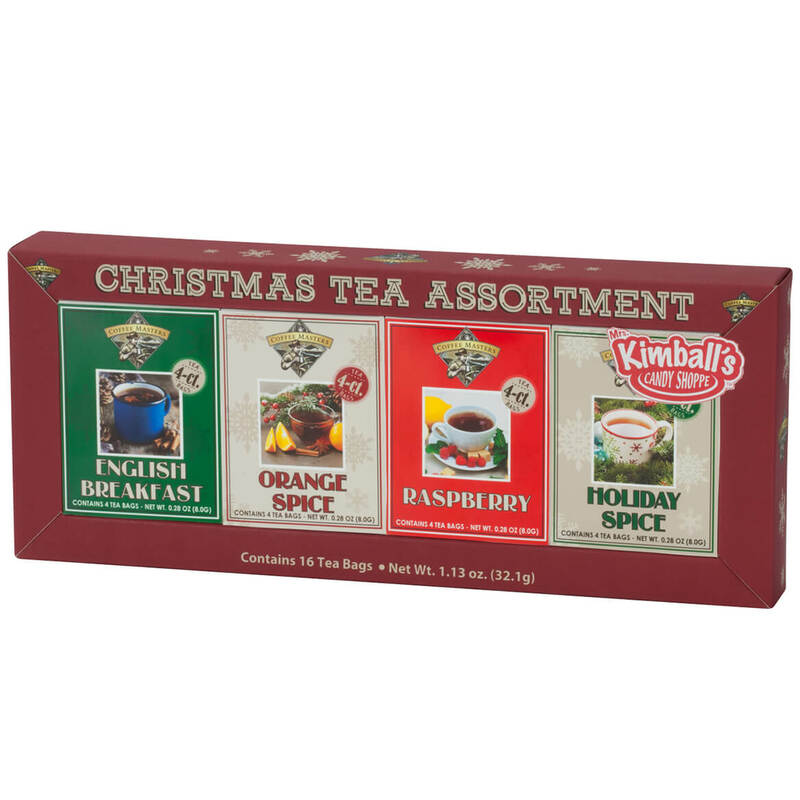 Set of 4 includes: English Breakfast tea (loved for its rich, full bodied flavor), Holiday Spice (our famous blend of black tea with a touch of spice and rich, inviting aroma), Orange Spice (the perfect balance of juicy oranges and zesty spices) and Raspberry (with the flavor of ripe, red raspberry for an invigorating cup of pleasure). Each gourmet flavor includes 4 tea bags. 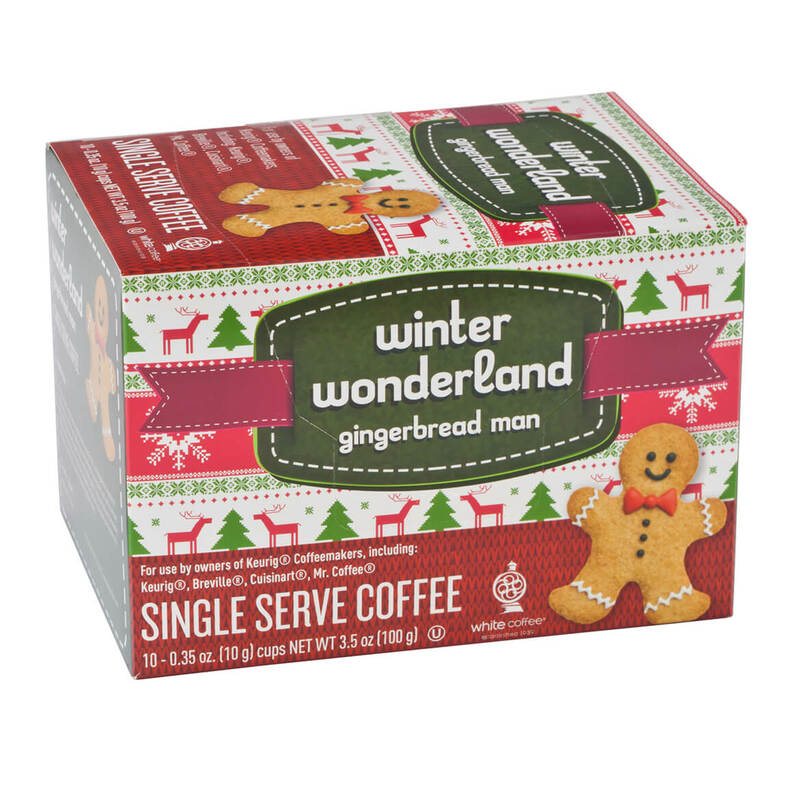 A sweet surprise for the holiday season, these Gingerbread Man single serve coffee pods feature the flavor and aroma of freshly baked gingerbread cookies. Boasting rich, satisfying flavor with a mellow, warm spice, this seasonal flavored coffee blend is made from premium coffee beans roasted and ground to perfection. Perfect for giving, serving and savoring all winter long, the caffeinated gingerbread coffee pods are compatible with Keurig, Keurig Breville, Cuisinart and Mr. Coffee. The box includes 10 K-cups (3.5 oz. each). 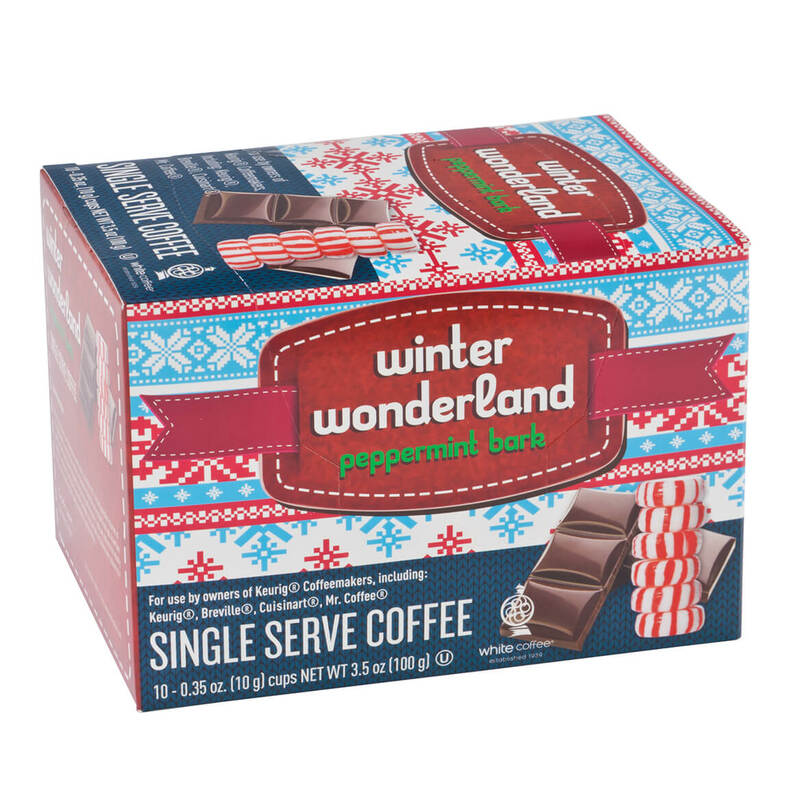 Making the season deliciously merry, these peppermint bark single serve coffee pods treat you to the unique flavor of creamy chocolate with a cool, minty finish. Made with premium coffee beans roasted and ground to perfection, the convenient peppermint coffee offers full-bodied flavor that’s smooth and delicious, all winter long. Perfect for giving or serving, the caffeinated coffee pods are compatible with Keurig, Keurig Breville, Cuisinart and Mr. Coffee. The box includes 10 K-cups (3.5 oz. each). 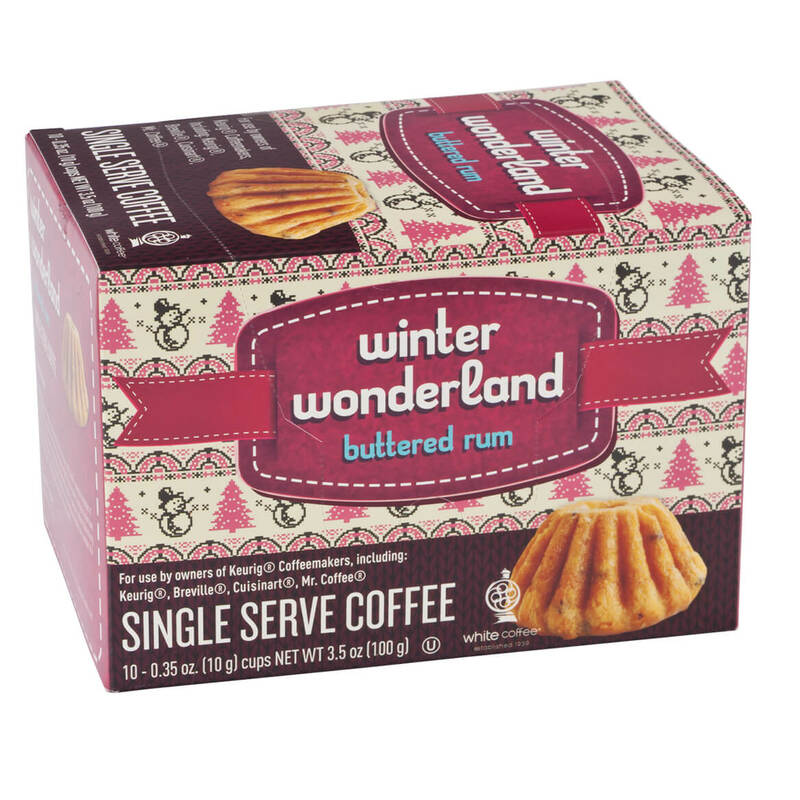 Offering the convenience of single-serve K-cups with true gourmet flavor, this Buttered Rum single serve coffee boasts the irresistible taste of rich buttered rum. Made with premium coffee beans roasted and ground to perfection, the easy-to-use coffee pods offer full-bodied flavor that’s sweet, spicy, smooth—and delicious day or night. Perfect for giving or serving, the caffeinated rum coffee pods are compatible with Keurig, Keurig Breville, Cuisinart and Mr. Coffee. The box includes 10 K-cups (3.5 oz. each).